It seems most everyone today wishes to have a movie star smile. Flashing a brilliantly white smile at the camera is more popular than ever with the advent of selfies and digital video. The desire to have glamorously white teeth may seem like a reasonably current trend. In reality, teeth whitening procedures have been around for many years. From early nomadic tribesman to today, we humans have always appreciated an attractively white smile. Even before the dawn of toothbrushes, early humans used “chewing sticks” clean their teeth, aiming for a whiter smile. Scholars discovered the quest for beautiful teeth was common practice in the days of Ancient Egypt. Historians believe that Egyptians crafted a rudimentary toothpaste from ground pumice stone and vinegar made from wine. Not far away in Rome, those interested in achieving a glimmering grin used a concoction of urine and goat’s milk. We can’t be sure of the results, but few people today would be willing to try this Roman remedy for yellowing teeth. Physicians of the 12th century prescribed a mixture of salt and sage herbs to scrub away plaque and tartar to achieve a whiter smile. People of the day also used the flowers of the Elecampane herb, also known as wild sunflower or horseheal, as a rudimentary teeth whitening remedy. The flowers were rubbed into the teeth and gums to clean teeth and remove yellowing. Later in the 17th century, barbers took over the dental care field. They filed the tooth surface with a metal file and then painted them with nitric acid to remove yellowing for a brighter smile. Arguably, this was quite an extreme (and likely painful) endeavor. Teeth whitening using oxalic acid came into vogue about a hundred years later. This chemical is now used industrially to seal marble sculptures and remove dark stains from the surface of wood. Although some edible plants do contain oxalic acid, in large doses it is known to cause painful kidney stones. Today, dentists do not recommend oxalic acid for teeth whitening. Around the turn of the 20th century, dentists accidentally discovered that when they applied hydrogen peroxide to the teeth and kept the patient under a heat lamp, the teeth would lighten in color. Jump ahead to the early 1960’s. It was then that an orthodontist while trying to treat a patient’s irritated gums, prescribed an overnight carbamide peroxide soak. When the dentist removed the orthodontic apparatus containing the peroxide from the patient’s teeth, significant teeth whitening had occurred. For the next couple of decades, dentists used hydrogen peroxide to whiten their patients’ teeth with varying degrees of success. Today, most dentists do not recommend hydrogen peroxide to whiten teeth. Too often it results in gum irritation and can also damage crowns, fillings, and dental implants. It can also cause erosion of the tooth enamel. Genuine progress in teeth whitening procedures hit the market in 1989. That was when Ultradent Products introduced Opalescence carbamide peroxide. This is still the primary method of teeth whitening used today. Processes and techniques have improved since the product’s introduction, however. Now dentists usually have the patient return for several treatments. Some treatments also use LED lights to assist with the tooth bleaching process. Technicians usually create molds of the individual patient’s teeth. They then fill the molds with teeth whitening gel and apply the molds to the patient’s teeth. This means a perfect fit with improved distribution of the gel and better overall results. More advanced measures of teeth whitening include veneers and other tooth restoration procedures that result in whiter, brighter teeth. These procedures are expensive in comparison with common tooth bleaching but result in a more permanently white smile. Some modern holistic practitioners suggest home remedies like rubbing strawberries or banana peels on the teeth for a white smile. These measures are, of course, messy, time-consuming, and do not usually return the results that patients are hoping to achieve. 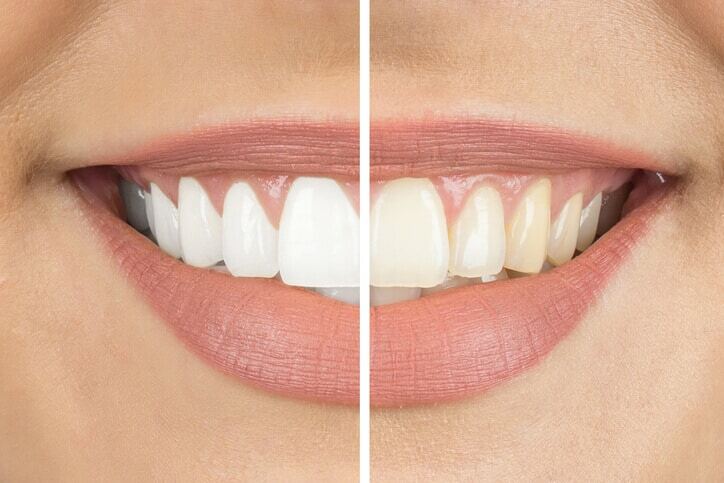 Considering Teeth Whitening for a More Beautiful Smile? If you’re ready to find out more about how you can get the beautiful, white smile you’ve always wanted, talk to the teeth whitening professionals at McCauley Dental. Our safe and affordable teeth whitening procedures offer long-lasting results for a beautiful smile you’ll be proud to show often. Just call 561-272-8555 to schedule a free consultation and see what McCauley Dental can do for you.